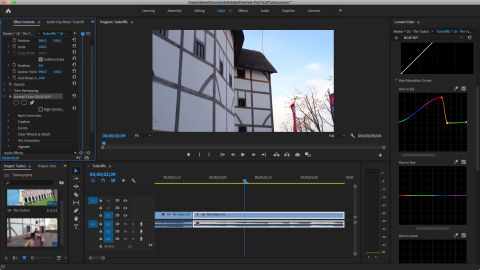 Will Premiere Pro’s latest improvements benefit your workflow? A huge list of improvements that are bound to be of use to many, if not most, Premiere Pro editors. It’s always a pleasure to see how Adobe can make an editor’s life easier with each revision change. A lot has happened to Premiere Pro since we took a look at it in July 2017: in the intervening time, Adobe has released three major updates to this venerable Mac and PC video editing software. It would be impossible to look at everything that has changed in the space of this review, so we will focus instead on some features we feel will have the most impact on veteran editors and newbies alike. Let’s start with the new Learn feature. It offers you three interactive tutorials to quickly teach you how to use their software. It’s an innovative approach which is triggered by default the first time you launch the software and is well worth checking out to understand where all the tools you need to get started are located, and what they do. The ability to open multiple projects at the same time is perhaps a feature you thought should’ve been implemented a long time ago, but this omission has finally been rectified. You can now see projects side by side (well, tab by tab to be more precise) and effortlessly move media and edits from one project to the other. If you work on similar videos, or often use the same assets, this is an incredibly useful addition. Adobe didn’t stop there to improve Premiere Pro’s visual effects capabilities. You could already use After Effects templates straight from within Premiere Pro, but you no longer need to have After Effects installed on your computer in order to do so, which can potentially save you a few gigabytes if another member of your team is responsible for creating those assets. Other useful improvements to the Essential Graphics section include the ability to move multiple layers at once by pinning a layer to another. When you highlight multiple text layers you can now alter the properties of all of them at the same time, like tracking, color etc. The font menu has also been tweaked allowing you to see an example of what each font looks like directly from the selection menu. And should you need your titles to roll on or off screen - in any direction of your choice, there’s now a simple button that enables you to do just that. Working with shapes is easier now: not only can you apply gradient colours to them, including graduated transparency, but it’s also possible to animate those shapes’ properties from the Essential Graphics panel - no need to jump into the Effects Controls to do this anymore. If you’ve ever struggled to match the color between shots, you’ll love the fact that Premiere Pro can now compare a chosen clip in your timeline with another. Click on ‘Apply Match’ and it will analyze the color of the second clip and apply it to the first. There’s even a face detection option to make sure the skin tones are as consistent as as possible. All of these changes, though most welcome and highly beneficial to many editors’ workflow, are nothing next to what Adobe did with the Lumetri effects. Not only can you apply multiple Lumetri effects to any one clip, and set them up to affect only specific parts of your image, the curves have been redesigned to make them simpler to understand and easier to manipulate: to change a particular hue for instance, you can use a color picker to select a part of your clip - this will add three points to the color curve. Moving those points will alter that particular color without affecting any other parts of your image. Compare two shots and click on ‘Apply Match’ to make sure their color is as automatically consistent as possible. You can apply masks to limit which part of the image you’re altering - a useful tool should your clip have areas of similar color and you only wish to alter one of them. As you’re dealing with moving images, you can alter the mask one frame at a time… but you’ll notice, if the selection is clear enough, that Premiere Pro may have already tracked your selection for you as the camera pans, saving you a lot of time. Visual effects aren’t the only areas Adobe has focused its attention on: the Essential Sounds panel also saw a number of improvements, like Reduce Noise and Reduce Reverb sliders, and it’s now possible to automate ducking so your background music never drowns out any dialog. Just make sure the audio clips’ type has been assigned to either Dialog or Music first. Once ready, change the settings to your liking in the Ducking section, and then click on ‘Generate Keyframes’ to let Premiere Pro do all the hard work for you. Finally, if you work with data-driven infographics, you’ll no doubt appreciate the fact that Premiere Pro now accepts data directly from a spreadsheet: just drop one into the Essential Graphics panel and you’ll then be able to cycle between different rows of the database to change the content of your graphic. These are just some of the changes to Premiere Pro since July 2017. The actual list of everything that Adobe has improved is very long and just shows that they’re definitely not resting on their subscription money. They’ve been working hard to improve the app, offer new, highly welcomed features, and fix things along the way (that should have been fixed long ago in some cases). If you’re a professional editor, this subscription model easily pays for itself. More casual editors would have to weigh the pros and cons carefully, but seeing all you can do with this app may well convince a fair number to take the plunge.